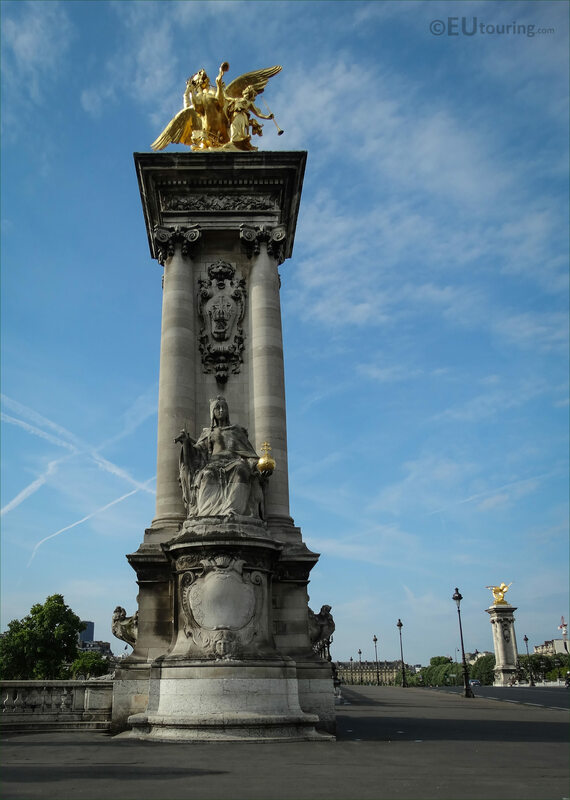 We were back at the ornate bridge called the Pont Alexandre III when we took these high definition photos showing the statue of France de Charlemagne, which was sculpted by Alfred Lenoir. 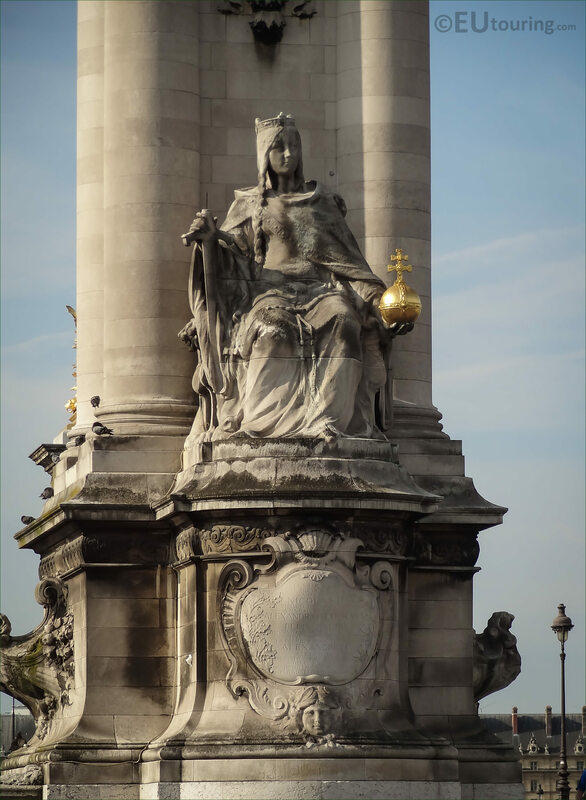 This first HD photo shows the allegorical statue called France de Charlemagne, which in English translates to Charlemagne of France and it is located on one of the four pillars located on the corners of the Pont Alexandre III. 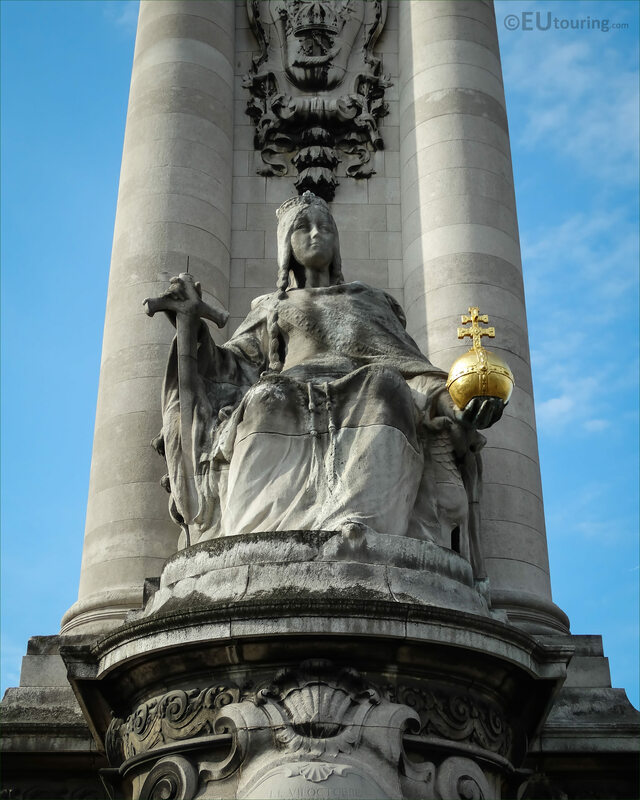 So here you can see the entire north east column, which stands an impressive 17 metres in height and has a gilded statue on the top called the Renommee des Arts along with the statue of Charlemagne de France located further down the column, also with a small amount of gilding to match. 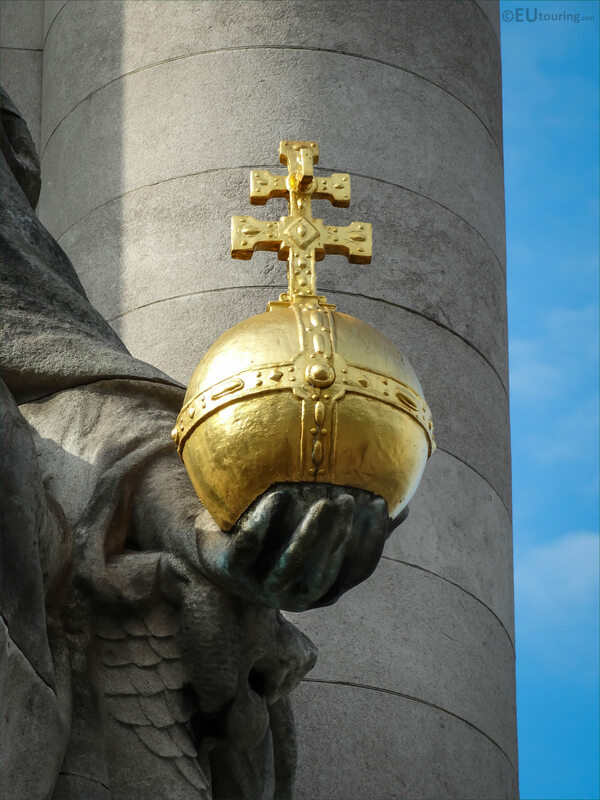 But this next high definition photograph shows the religious gold ball with a cross, which has a name of Globus Cruciger, and it is a cross bearing orb that has been a Christian symbol of authority since the Middle Ages, and as you can see from this close up, it is normally held within the hand of an earthly ruler, although in art it is sometimes depicted being held by an angel. 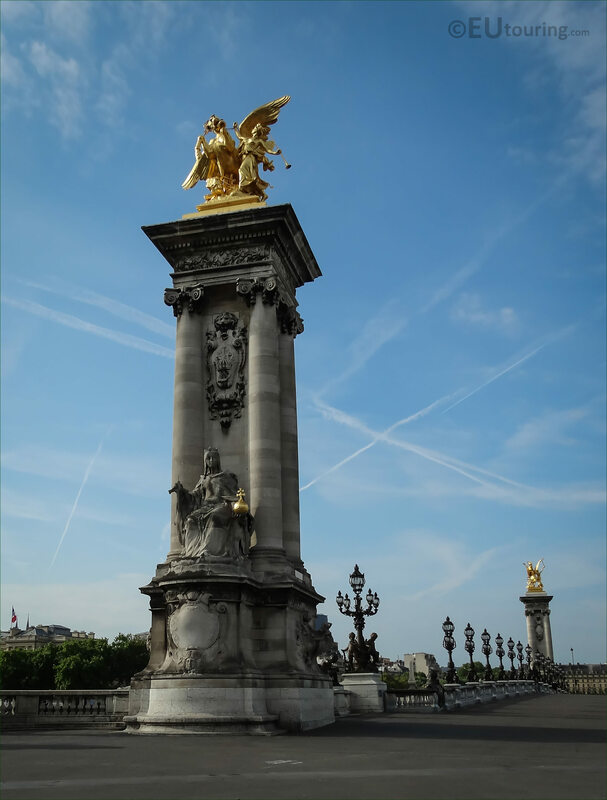 We were standing on the right bank of the River Seine in the 8th Arrondissement of Paris looking over the Pont Alexandre III towards another famous tourist attraction called Les Invalides, when we took this photo, and as you can see, this is the left hand side column on the upstream side as you are looking at the ornate bridge. 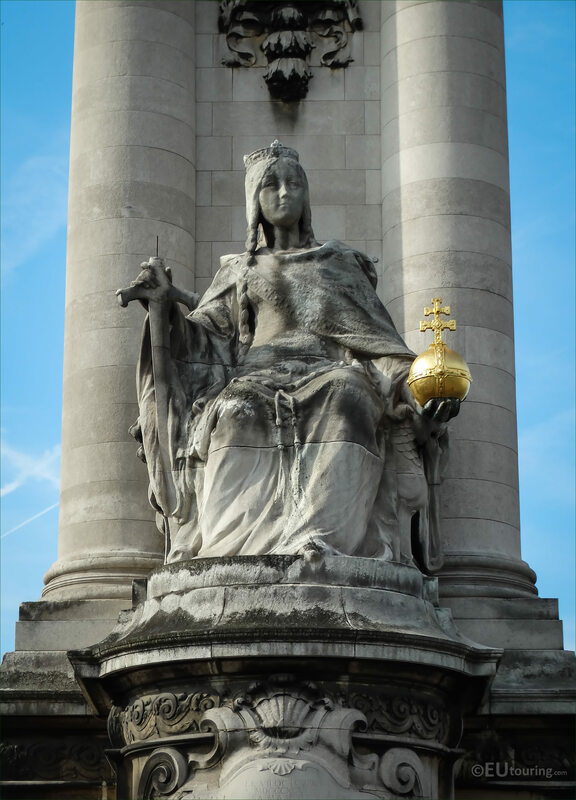 Although this statue is called France de Charlemagne, it is also referred to as La France du Moyen Age, which in English translates to France of the Middle Ages, and this is when Charlemagne was ruler. And often referred to as Father of Europe, it was Charlemagne that managed to unite most of Western Europe, which had not been the case since the Roman Empire. 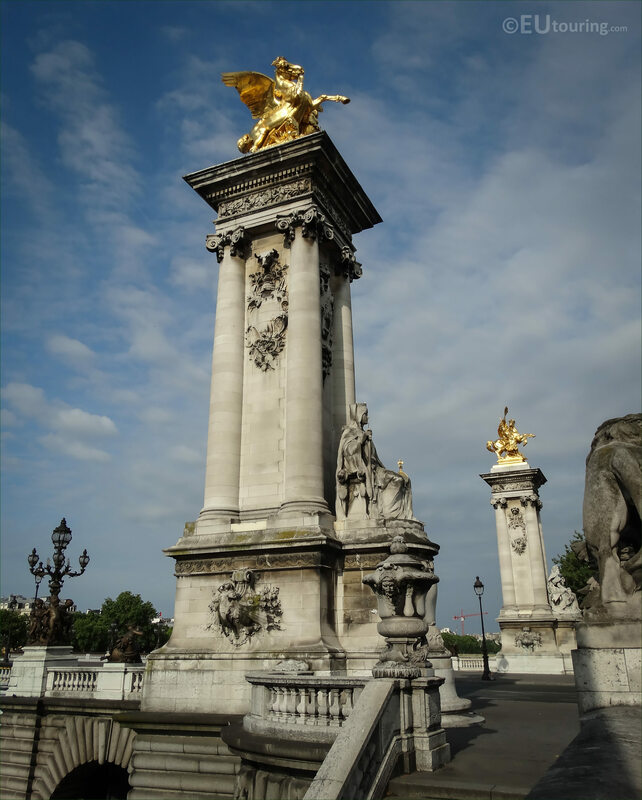 Now there were numerous different sculptors commissioned to produce the different statues and sculptures found on what is referred to as the most ornate and most extravagant bridge in Paris, and La France du Moyen Age, or France de Charlemagne was sculpted by Aflred Charles Lenoir. Yet this last image shows the detailing that went into producing this large statue of the figure holding the gilded Globus Cruciger, by Alfred Charles Lenoir who was born in Paris in 1850. And having been trained by French artists like Jean Baptiste Guillaume and Pierre Cavelier, he started to receive numerous public commissions for different sculptures and statues. So, as well as the France of Charlemagne statue on the Pont Alexandre III, some of his works can now be found within one of the well known museums in Paris called the Musee d'Orsay, plus he produced a statue for the Hotel de Ville and two funerary tomb sculptures for the royal chapel in Dreux, to name a few, being awarded the title of Officer of the Legion of Honour in 1900.